Back in October, we were honored that our site for The Phillips Collection’s Jacob Lawrence Exhibition was chosen by Communication Arts as a Webpick of the Day. 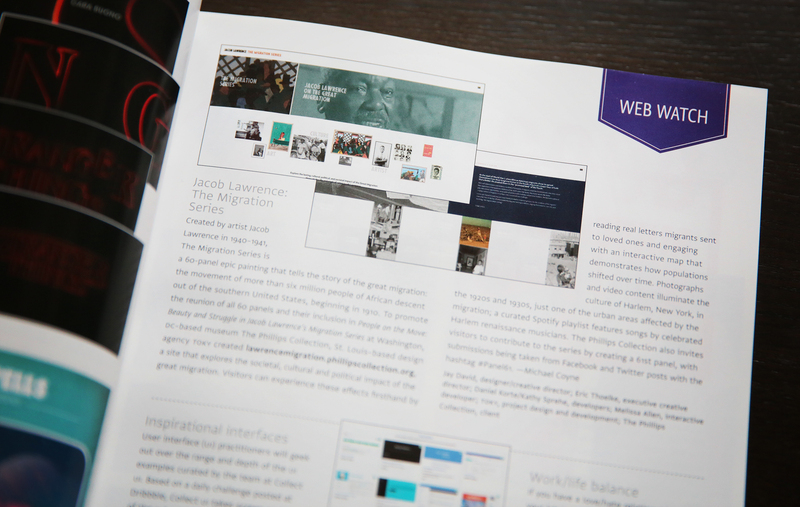 This month, we opened the March/April 2017 printed issue of the magazine to find our Jacob Lawrence site featured in Communication Arts’ Web Watch section. Known as America’s first museum of Modern art, The Phillips Collection in Washington, D.C. houses a world-renowned collection of modern and contemporary pieces. In preparation for an exhibition featuring Jacob Lawrence’s 60-panel Migration Series, the museum engaged TOKY to create an online resource exploring the cultural, political, and societal impact of the Great Migration and the artist himself. Congratulations to our friends and clients at The Phillips Collection on this amazing honor!